Air Optix Night and Day Aqua feature one of the highest levels of oxygen permeability on the market. They are monthly lenses and can be worn for up to 30 days continuously without removal. 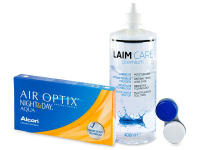 Air Optix Night and Day Aqua contact lenses by Alcon are designed to be worn for one month. 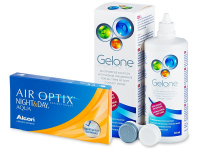 According to the manufacturer, these contact lenses can be used for daily wear (insert them in the morning and remove them in the evening), but they are also designed for continuous wear. For some users, the lenses can be worn without removing for up to 30 days and 29 nights. Air Optix Night and Day Aqua contact lenses are exceptional for their high oxygen permeability, which supplies the cornea with a sufficient supply of oxygen, even when the eye is closed while sleeping. This package contains 6 lenses. According to the manufacturer, the lenses should not be worn continuously unless consulted and directed by an eye-care professional. Continuous wear is not suitable for all users. Furthermore, it should be noted that even among eye care professionals, the attitudes towards continuous contact lens wear vary considerably. Many eye care professionals do not recommend continuous wear at all; others recommend taking the lenses out after five days, etc. Air Optix Night and Day are undoubtedly among the highest quality contact lenses available on the market. Nevertheless, it is highly inadvisable to buy these contact lenses without professional fitting. The lenses have a very small diameter (DIA = 13.8 mm), which fits a considerably smaller percentage of wearers than the more common diameters 14.0 or 14.2. Great. I can put these lenses in and go about my day without worrying about them. You notice the increased moisture in them as soon as you put them in and they never dry out even after wearing them for a while. What does the BC mean either of 8.40 or 8.60 ? The BC (Base curve) is the measurement of the back curvature of the lens in millimeters. It is important to select the correct BC to ensure a good fit which will provide both comfort and allow oxygen transmissions. You can find your own BC on your personal prescription, if you cannot locate this please speak with your optician as they will have this on record. It is possible to wear lenses with a slightly different BC than prescribed but again it is best to speak with your optician beforehand. Been wearing these for a while they're great. Do you also have air optix night and day color lenses? Do you have air optix night day aqua astigmatism lenses? I am looking for something I can wear overnight, but have astigmatism. Any help would be great. I have experience with other continuous wear lenses, so I know this type of wear is suitable for me, but is there any difference between brands? I would like to change from Acuvue Oasys to the Cibavision Air Optix Night & Day. Hi Harriet. Acuvue Oasys are bi-weekly lenses that are approved for up to one week of extended wear, while the Air Optix Night and Day Aqua are monthly lenses that can be suitable for one month of continuous wear. Because of the difference in the replacement schedule, it is very important to check with your ophthalmologist before beginning a continuous wearing regimen. Perfect lenses for driving at night. I've never had clearer vision with any other lenses. Really good product. Very quick and easy to order. Excellent delivery time. Thanks! I use night and day aqua for business trips. Sum up - Comfortable contacts for overnight wear. Generally progressive lenses are also called multi-focal lenses. You can see our full range of multi-focal lenses here: https://www.alensa.co.uk/…-lenses.html In terms of your exact prescription, we would recommend consulting with your optician before making a purchase. If you need any more info, you can contact our customer service team via phone or email. At Alensa, we are committed to offering you the lowest competitive price on the market for contact lenses. The price has doubled since my last order 6 months ago? I'm going elsewhere.